If you’ve already tried gel, powder, pencil, powder and stencil and you still think your brows look sparse, the microblading may be the best solution for your thin brows. Microblading has become more and more popular over the years and almost everyone knows a thing or two about it. The secret behind its success? It cannot be beaten (at this moment, anyway) when it comes to durability or natural appearance. Is there only one type of microblading? 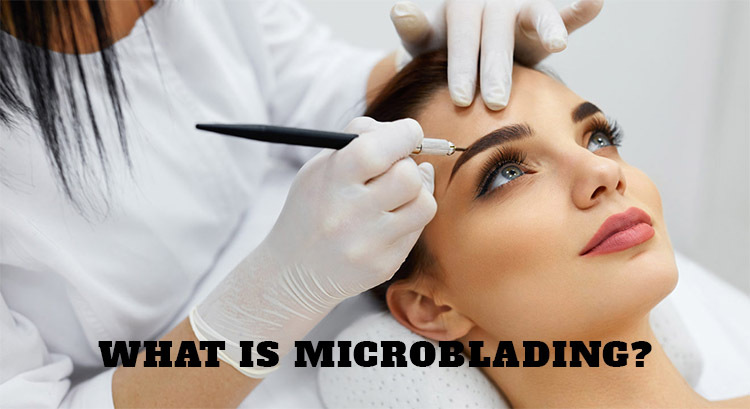 What are the main things to keep in mind about microblading? Microblading is in fact a form of face tattoo technique and it’s less scary than it sounds. Unlike a regular tattoo though, microblading is about pigment being implanted under the skin using a manual handheld tool and not a machine. The tattoo artist is going to draw hair-like strokes with its tool for creating naturally looking hairs in the brows. Microblading isn’t as deep as a regular tattoo, but it’s still a tattoo as the pigment is going to be implanted under your skin. Microblading is quite new, but this doesn’t mean that there aren’t several techniques related to microblading. For instance, microfeathering means that only few touches are going to be made on the existing shape of your brows. We can also talk about ombre or microshading, which is a lot like the brow makeup with more noticeable filled-in look and not so many hair-like strokes. There are many things to remember about microblading, but some are more important, especially because they’re eliminating the misconceptions related to this technique. Pain is rather personal and some may feel more than others. However, the general impression is that microblading is as hurtful as scratching. You’re going to feel it, but you’re not going to be climbing up the wall from the pain. It’s far from being as painful as giving birth, for instance. Applying topically a numbing cream is going to help, reducing the discomfort throughout the whole process. If you know you cannot take pain in any way, it’s wiser to apply the numbing cream even an hour before beginning the microblading. Despite what many can say, the numbing cream doesn’t inflame the skin nor reduces the precision during application. You should know and do some things you try microblading and you need to pay attention to anything that may thin out your blood. If you like to drink, use retinol or take aspirin, it’s better to stop one week before starting the procedures. Retinol thins your skin and you’re going to bleed a lot more. In addition, this is also going to compromise the chance of the pigment to stick. Stay away from aspirin, caffeine, alcohol or blood thinners during the healing process as well as you want to maintain the results. This sure depends a lot on the experience of the technician and you want one that has the patience to do it right. However, 2 hours is what you typically need to spend for microblading. Once you’ve microbladed, you need to protect the freshly bladed brows from moisture. This means you shouldn’t swim, go to the gym or even wash your face for an entire week. If you’re going to get them wet, the scab is going to come off way too soon, so you’re going to lose all the pigment. The risk for itching and redness isn’t null, especially during the first week. Use some Vaseline for soothing this kind of symptoms. Even if your brows are going to look a bit darker in the beginning, take note that the color is going to fade 30 to 40%. You may get some aftercare ointments too. The brows are going to look pretty right after the procedure and the mild redness or swelling are quite normal. Remember that you’re not going to be able to use makeup or other products on your brows during the healing process. You need to see it as an open wound that takes time to heal. Your skin and lifestyle count a lot for the durability of the results. Typically, you’re going to have to go for some touch-ups every six months. No matter how microblading is, you need to take it with a grain of salt and keep in mind that the brows are going to fade eventually. One’s body may metabolize the pigment faster and in the case of oily skin, the pigment is definitely going to break down sooner. The strokes may blur and soften in time. Don’t think that they’re going to look sharp forever, as they’re not. Truth be told, the first treatment may cost you up to $900. Sure, you can find lower-priced services too, but it’s better to stay safe and pay the extra buck for the experienced technicians. Microblading is a form of tattooing so you need an expert hand. No matter how much you prepared for the microblading, the risk for a microblading go wrong is never null. Even is the results being semi-permanent, you may still fix the mistakes when it comes to color and shape of the new brows. The most regular mistake that technicians make is not selecting the right brow shape for you. As a matter of fact, there are many technicians out there that don’t pay attention to your face, creating a shape that is totally wrong for you. This unpleasant mistake actually happens a lot more often that the ones related to the technique itself. It’s also quite common for the technicians not to be careful with the thinner areas of your skin. in these thin areas the pigment may be placed too deep. This is going to make the pigment heal with a blue or gray undertone, which is far from everything you wanted for your new brows, for sure. If the pigment is simply too dark or if the shape doesn’t do you justice at all, the best solution for solving the problem is to try a laser removal. If the mistake isn’t too dark or too deep, you may want to try conceal it with microshading, which is also a semi-permanent brow technique. This procedure uses pin-dot pigment application in order to create the appearance of pomade or powder brow makeup and a perfect ombre finish. Keep in mind that this procedure is only going to work if the microblading was symmetrical and if the imperfections weren’t major. Even if the technician is doing the whole microblading, he/she’s not the only one to blame in the situation of a mishap. You need to be aware that going with a cheaper option comes with a risk. The more you’re willing to pay, the more you can expect in terms of results and the situation happens the other way around too. Going with a cheaper option is going to end up cost you a lot more later on as you’re going to have to repair the initial results. Long story short, it’s important to do your homework and get all the info you need when choosing your technician. Take time and check the portfolio of your future technician. Ask around and check the reviews on the social media as you should trust the happy and unhappy customers. Even if poor microblading may be corrected, you should also remember that you’re going to have to wait until the fixing. The initial results have to heal before you go to another technician and repair the damage. This may take even a month, but the wait is going to worth as the new and more experienced technician is going to help you get a better appearance for your brows. Next Next post:Cold Brew Hair- Why Try It and How to Take Care of It?